SANDAG, the San Diego Metropolitan Transit System (MTS), and Caltrans District 11, together with the cities of Chula Vista and San Diego, celebrated the launch of the new South Bay Rapid service between South San Diego County and Downtown San Diego and the opening of the Otay Mesa Transit Center on Jan. 28. Full service began Jan. 27 on the new South Bay Rapid route (route 225). There are 12 stops along the 26-mile route, which operates between the Otay Mesa Transit Center in south San Diego and Downtown San Diego via eastern Chula Vista. South Bay Rapid operates seven days a week from 4:30 a.m. until 11 p.m. 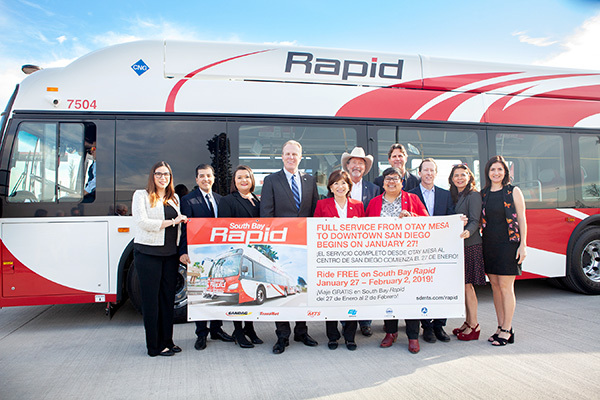 The opening of the Otay Mesa Transit Center and launch of South Bay Rapid service builds upon recent border transportation improvements, such as the expansion of the San Ysidro Port of Entry and Cross Border Xpress. All of these improvements along the United States/Mexico border help support the binational region’s interconnected economy, as well as San Diego County’s environmental and climate action efforts. In addition to Mayors Vaus and Dedina and Council President Gómez, Mayor Kevin Faulconer and San Diego Council member Vivian Moreno, Mayor Mary Casillas Salas from the city of Chula Vista, Director Cory Binns from Caltrans District 11, Ambassador Marcela Celorio from the Consul General of Mexico, and Otay Mesa Chamber of Commerce Executive Director Alejandra Mier y Teran also were on hand to commemorate the milestone and greet morning commuters. South Bay Rapid operates daily. For more information on schedules and fares, please visit rapidmts.com.